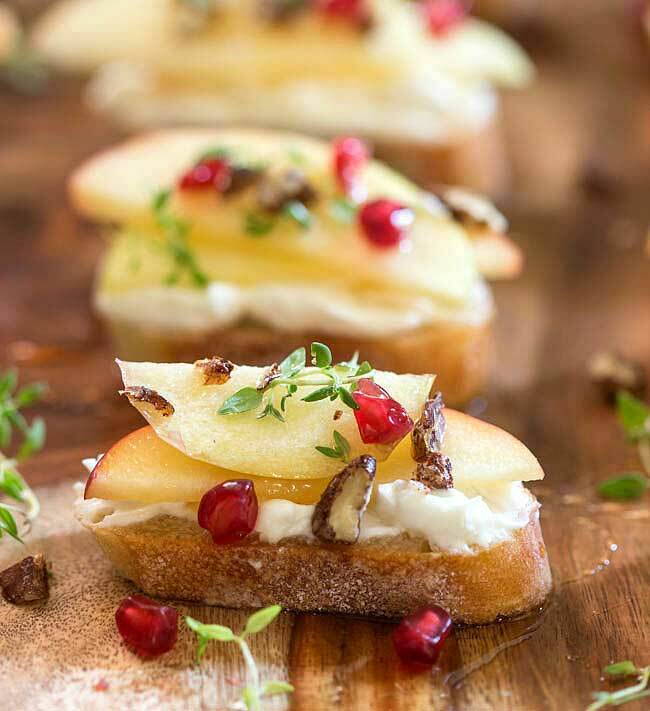 These Goat Cheese Bruschetta appetisers are topped with honey crisp apples, pecans, and a drizzle of honey. This apple bruschetta recipe is a great twist to the classic tomato topping and a perfect starter to an elegant meal. 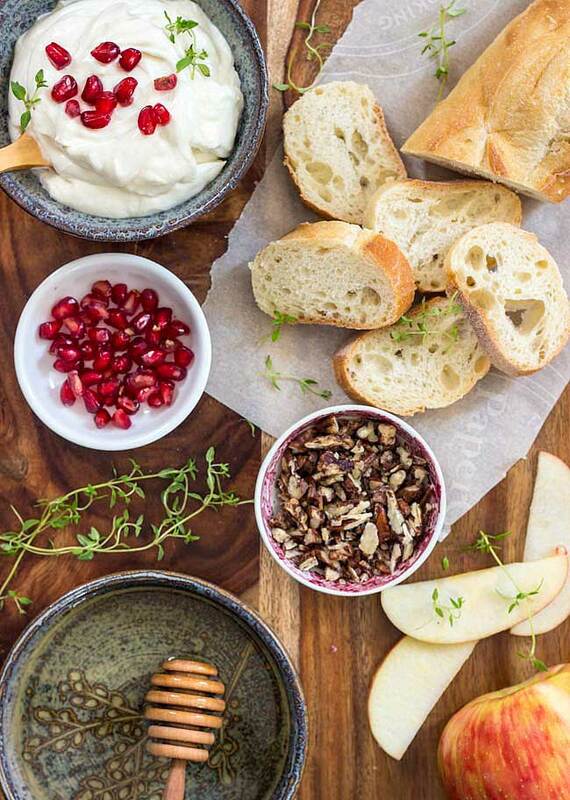 When you mix local apples with goat cheese, candied pecans, honey and pomegranate seeds, well, let’s just say the deliciousness factor is magnified by ten! Lots of texture, sweetness and colour make up this goat cheese bruschetta recipe. The little jewels of the pomegranate always add something special, don’t you think? If you’re confused about how to open a pomegranate, check out YouTube but I must confess, I’m too impatient to do it with the water methods or cutting it into six chambers. I simply score it around the middle, twist and open it up. Flip each side upside down in a bowl and tap with a wooden spoon and your seeds will pop out. 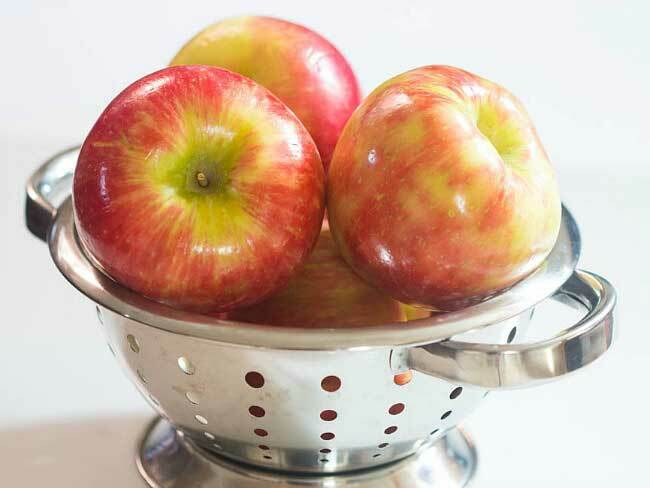 Wash your apples very well and if they’re not organic, you’ll want to peel them. I love Honey Crisp apples for this snack because of their sweetness but you can change it up if you want – just be sure to pick a sweet one. Topping this tasty little bite with thyme and a drizzle of honey will have you smacking your lips and reaching for a second..and a third! Another way to keep this low on calories is to use whole wheat bread and regular pecans or your nut of choice. 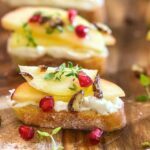 These tasty little goat cheese bruschetta appetizers are topped with tons of flavor and texture - apples, pomegranates, pecans and thyme. A drizzle of honey takes them over the top! If toasting the baguette, preheat oven 350 degrees. Brush baguette slices with olive oil. Season with salt and freshly cracked black pepper. Bake for 10 minutes or until slightly brown and crisp. Remove from oven and set aside. In your blender place goat cheese, cream cheese, heavy cream and honey. Blend on high until whipped and fluffy - about 2 minutes. Scrape mixture into a small bowl. Place baguette slices on serving platter and spread whipped goat cheese mixture over each individual piece. Thinly slice the apple and place one or two pieces on each. Top with chopped pecans and pomegranate arils. Drizzle with honey and top with pecans and chopped thyme sprigs. When are Apples Available at Barrie Hills Farm?